Malibu Rocky Oaks Estate is set a luxurious venue for a wedding. Ceremonies are held on the private helicopter pad. Dining al fresco is one of the signature looks that you will find here. Overlooking the Santa Monica Mountains the views are gorgeous. Getting ready in the estate is like a Tuscan villa right here in Malibu. Brides love the Mediterranean vibe. 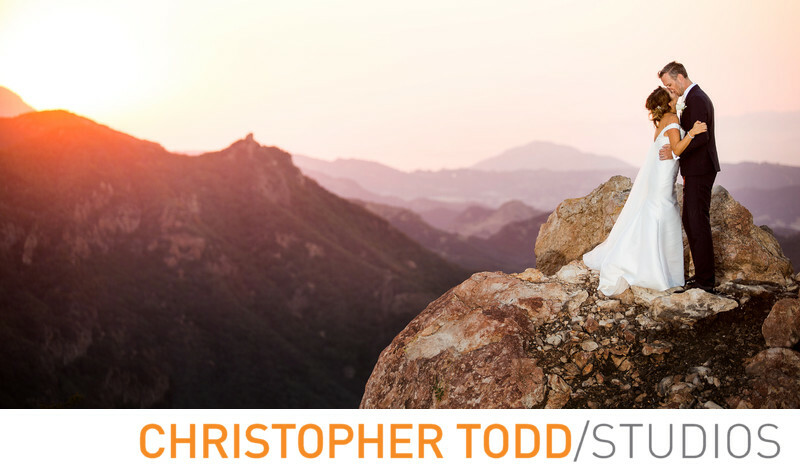 In this photo the bride and groom had to climb up onto this boulder for the most romantic portrait. With some assistance from the groom and the photographers we were able to get the couple up here. The results of this photo are perfect. For more info on your wedding at Malibu Rocky Oaks Estate visit our blog here. 1/100; f/2.8; ISO 100; 115.0 mm.